A question that I get asked on a pretty regular basis is, “Does my dog/cat need a heartworm preventative?” And my short answer to the question is always… “yes.” Not because I want to sell you something or I think your pet needs more treats or some such, but because I have seen heartworm disease and the long term consequences and know that if a simple preventative can be used to stop it, then that is what I will recommend. I find that most people are familiar with heartworm disease, but in the past, the Pacific Northwest has been isolated from heartworm disease a bit. But things like travel, rescue and even climate changes have allowed the increased incidence of this once almost foreign parasite. Even recent storms that have hit our nation can perpetuate the spread of the disease as misplaced dogs end up in shelters all over and with them come their little parasite friends. 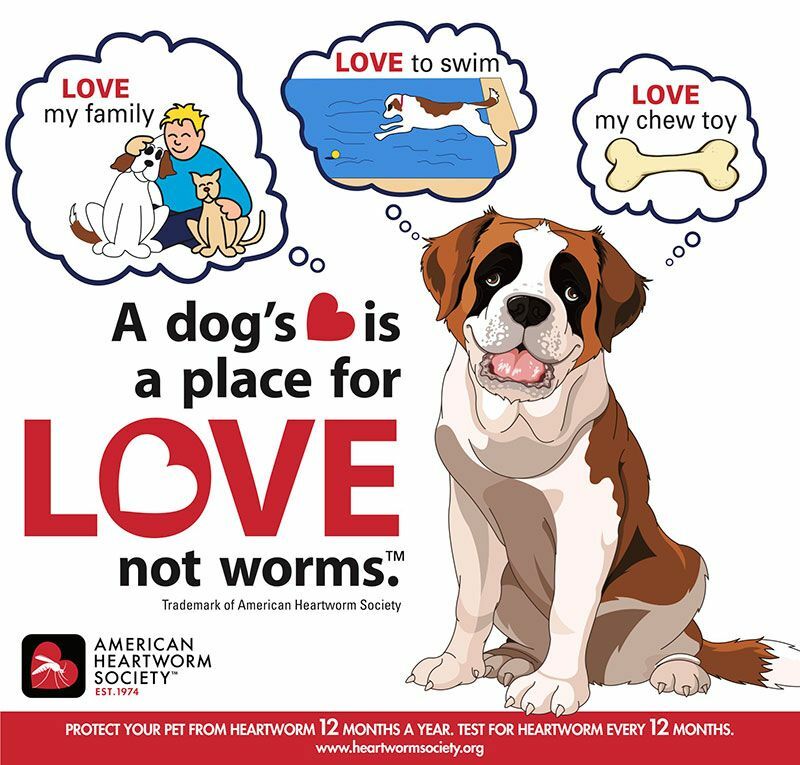 Many years ago, cases of heartworm in Oregon were most commonly found in the southern counties, but recently, most all counties in our state are reporting several cases a year. Mosquitoes are an essential part of the heartworm life cycle because they are responsible for spreading the larva from one infected animal to another. It only takes one bite from a mosquito that fed off of an infected animal to spread this awful disease. Even dogs and cats kept mostly indoors could be infected as mosquitos can frequently be found indoors as well. Once a pet is bitten by a mosquito over a span of months the larvae reach maturity and become lodged in the right side of the heart. Once adults they produce more larva thus increasing the pet’s worm burden and making that pet infective to other pets. Most people are aware of heartworm disease being a problem for dogs, but cats are not immune and though the disease often doesn’t progress the same as a dog and can be harder to diagnose, the unfortunate outcome is often the same. Dogs (and cats) that suffer from heartworm and go untreated eventually suffer from heart failure. 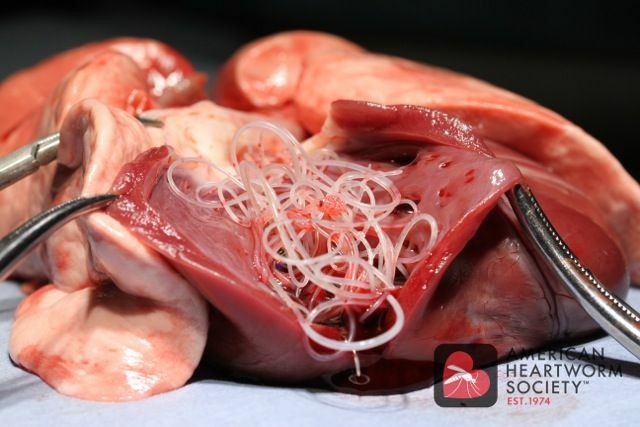 Heartworm is not an easy disease to treat though, the medications used to kill adult worms are very strong and can have very dangerous side effects, the course itself takes about two months and sometimes has to be repeated. Sometimes pets can be so heavily infested that the parasites have to be surgically removed for the pet to have any chance of survival. Surgery doesn’t ever sound cheap, the drugs used to treat heartworm aren’t cheap and hospitalization is required for a portion of the treatment, again not super cheap. But you know what is by comparison?! PREVENTION!! I know we say it all too often, prevention is key, but we say it because it is true!! High-quality preventative products are essential to keeping all pets healthy. Products like Heartgard, Trifexis, Revolution, or Advantage Multi should be used every month as a strategy to prevent an awful infestation. Regular testing (usually done yearly) is also recommended to ensure that the prevention strategy being utilized is working. So again, my short answer… yes. Prevention is key. Please don’t let your pet succumb to this terrible and often fatal disease. If your pet falls into any of the categories that may cause inevitable OA, there is a way to try and prevent their pain for a long time. Learn about it here!